These are, in fact, all crickets but what wasn't playing the game was the way the house had become infested with them over the last couple of hot weeks. 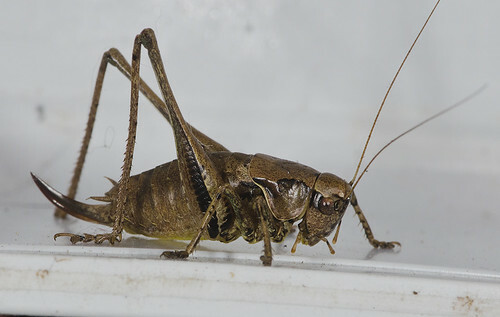 One cricket chirping near the ceiling can seem charming, crickets jumping, crawling and calling all over the house can become intimidating. When I found one on my keyboard I decided enough was enough. A policy of zero tolerance seems to have solved the invasion for now. They are easy enough to catch and can be ejected into the real world to take their chances with birds and lizards in a far more natural way than meeting their ends squished in doors and crunched underfoot. 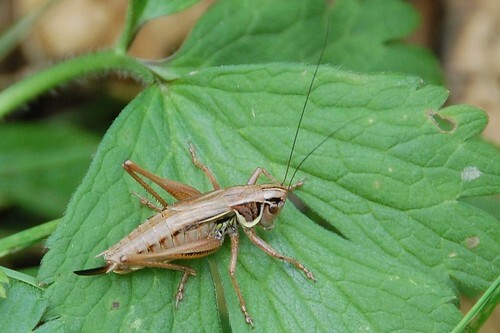 Above the Dark bush-cricket, Pholidoptera griseoaptera - a female (distinguished by ovipositor, photo by Paul) which were by far the most frequent intruders this year. Their wings are atrophied but they make up for it with enormous springy legs that can carry them long distances in a single bound. These are a species that are eaten by humans, fried and spiced. If I was a carnivore I suppose I might have tried a few myself but sometimes being a vegan has unexpected advantages. Not having to eat crickets is one of them. I am a little more kindly disposed towards the Roesel's Cricket, Metrioptera roeselii - another female, if only because they are considered somewhat unusual in the UK. Of course, they don't seem all that scarce in this part of France but affection is a fickle thing and their rarity over there leads me to look fondly on them here. Even so, they're not adverse to nipping in for a quick meal of fruit flies and resting micromoths if they get the chance. 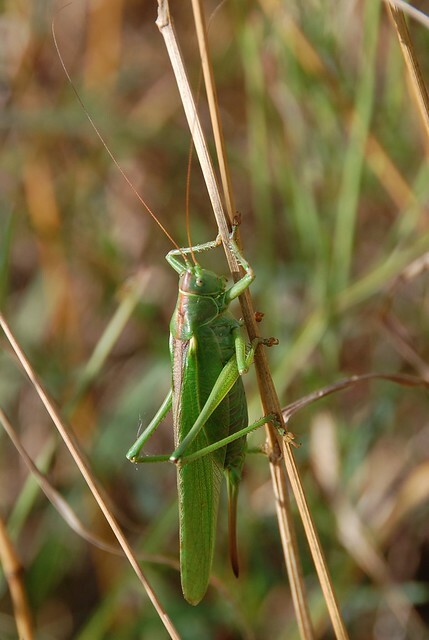 The Great Green bush cricket, Tettigonia viridissima is a favourite, not least because I've never found one the house yet. They have their wings and although they are weak flyers they are the closest thing to fairies I've ever seen with slim green bodies and gauzy wings held straight out to the sides. These look as if they'd have the most calories in a survival situation simply because they are huge but I'm still not that tempted. Quite attractive, esp the last one. What do the cats think?